These value priced scissors have handles made of a durable plastic and are contoured to fit comfortably around your fingers. The blades are made of ground stainless steel and cut cleanly through multiple sheets of paper. Available in 5", 6" and 8" sizes, they are perfect for school, office, and to keep in every room in the house. 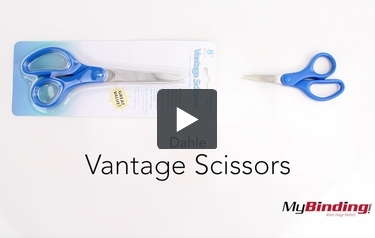 This is Dahle Vantage Scissors! They have a hard plastic handle with a stainless steal blade. If you think of plain and normal scissors then you’re looking at the right ones. They’re not always the most comfortable in extended use, but they’re cheap and they cut paper just fine. Of course I can’t just say they cut paper(and other things), here is proof as I cut through this stack. No real surprises here. You can find them in 5, 6, or 8 inch sizes.